It’s almost time! 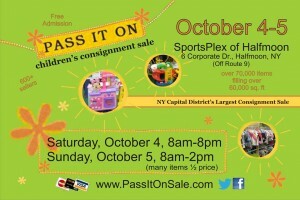 The Pass It On children’s consignment sale is coming in two weeks! Would you like to win a pass for you and a friend to enter before the public on Friday, October 3rd at 5 PM? Keep reading…. 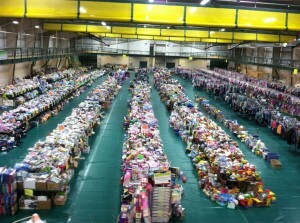 The Pass it On sale is the biggest children’s consignment sale in the Capital Region with over 650 consignors and 60,000+ square feet to shop in! It’s really an amazing sale where you can find everything from baby gear to junior clothing. Pick up like-new shoes, toys, books, DVDs, strollers, clothes, sporting equipment and more at this sale October 3-5, 2014 at the Sportsplex in Halfmoon! This sale will feature warm weather clothing and items such as coats, boots and many other clothing items appropriate for the season. In addition there is always an abundance of toys, books, kids bedding, baby equipment (walkers, strollers, etc), kids furniture, sports equipment and more. Everything for ages newborn to teen. All items are inspected to ensure a quality shopping experience. I am excited to again be giving away early admission passes to TEN lucky readers! Enter now by leaving a comment telling me who you would shop for at this sale. Leave your comment by 9 PM on 9/24 to be entered to win! Winners have been notified by email. Congratulations and stay tuned for more giveaways! I would shop for my twins and also for my nieces! I will be shopping for my daughter 6, son 8 and niece 4 and nephew 7. Can’t wait to shop. It is my first time. I will be shopping for my 5 year old daughter. She’s growing like a weed! I would shop for my love of my life, my grandson Abe. He will be 3. First time grandma. Shopping for my brother who is having twins!!! For my 3.5yr son and 10mo daughter! Christmas shopping for my 3 year old son and 6 month old daughter 🙂 We LOVE Pass it on!! Grandsons to be…yes twin boys! I need Christmas toys for my three grandchildren! Always find such amazing finds at passion! I would shop for my 5 year old son. These sales are so awesome! My company that I worked for for 10 years closed and I was out of work for 8 months. Then when I found a new job it was significantly less in salary as I had to start over. This sale allows me to buy new school clothes for my kindergartener! I love thus sale. Have been doing it for years! I go overboard buying for my 2 nephews! I would love to ein! I would shop for my grand daughter. My 10 & 8 yr old daughters are so different, I love the huge variety at Pass It On!! I will be shopping for my 4 month old son. We are in need of some warm cloths for him. My 3yo main man! Need to stock up on winter gear! Would shop for my friend who lost her son this year at 32. She’s having her first granddaughter in October. I would shop for my daughter!! I would shop got my brand new baby girl, Genevieve. She is three months old and needs some warmer clothes! I would shop for my twins who will be 3 years old in 8 days! Shopping for my two year old triplets! I would shop for both my 4 yr old son and 2 yr old daughter. My 2 year old and 2 month old! I’ve never been able to go to this sale but I’ve heard great things! I will shop for my 19 month daughter who is out growing her clothes! I would be shopping for those items I’d like my children to have, but cannot pay full price for :-). I love these sales! I would shop for my soon to be daughter that is due to arrive in 8 weeks! My little 2 year old lady! I would be shopping for my nephew who lives in Canastota Ny as they don’t have these wonderful sales up there. I would shop for my boys! My four month old is wearing 18month clothes! We were not prepared for such a big baby!!! My husband and I would shop for our two boys! I’m shopping for my 5 mo old and 20 no old boys! I would shop for my 7 year old daughter. My son! He’s six months old and I have yet to be on the ball enough to get a new mom pass. Great sale! Shopping for my two boys 3 yrs & 6 mos 🙂 plus friends & extended family! I would shop for my son and my nieces and a couple special little ones arriving soon! I would be shopping for our daughter and our daughter due in July!!! I would shop for my handsome 3 month old son. I would shop for my sons, 5 and 2! I would shop for my daughter and two nieces or nephews I have coming next year! My son, my friends, and my classroom! I would shop for my 7 kids (3bio/1adopted/3foster). Thanks for the opportunity. My son (18m), daughter (3yrs), and neice (arriving soon)!!! I would shop for my sweet baby girl Emma! Just 16 weeks old and such a sweetheart! This sale is the best! I shop for my three boys and always find incredible deals. My two month old and three and a half yr old. We need some clothes and Xmas is coming, so I’ll keep an eye out for cool toys. Thanks! I will ahop for My 8month old son! We have two children and are adopting two more…I shop for 4 now! I would be shopping for my twins Hanna and Ethan. They both need winter jackets. I would shop for my 2-year old! My 6 month old daughter, Natalie. Shopping for the first time there for my very first granddaughter!!!! I would should for my daughters! I will be shopping for my almost 2 year old daughter, my baby due in february, cousin due in december, and niece/nephew due in april. I will be shopping for myself(maternity clothes) my 1 year old son and my son who is due in February!!! I’ll be shopping for my two year old and my new one on the way!!! I will be shopping for my 19 month old son who has grown out of his 18 month clothes! We don t have many 24 month clothing and would love to get more clothes for him. I Would go shopping for my two year old daughter my 6 month old niece and my 7 year old god daughter and my new little girl cousin that we will be welcomeing in January I love the pass it on kids sale we go every year get a lot of stuff for the kids in our family. I would shop for my 4yr old daughter and a few friends babies that are on the way! I will be shopping for my two year old daughter! I would be shopping for my 8 month old and 3 year old. I would love to shop for my daughter who is 7 months. Our first :-). My toddler niece just moved back to the area and I would love to get her some things as well! 5pm passes would be just fabulous! I would shop for my 3 kids, age 10, 5 & 3. I’d also shop for my friend, pregnant with her 3rd. She also has a 4 & 2 year old. I will be shopping for my son! My 2 year old daughter!! I shop for my twin grandsons! My 2 year old daughter, growing out of Ll her clothes! And stock up for bday and Xmas gifts. I would be shopping for my son, 7 months old, my nephew, 8years old, and my sons brother, 4 years old. I will be shopping for my daughter and baby boy who will be born this December! Snow gear and Halloween costume for my boys. Maybe some larger items as well. Love, love, love this sale! I shop for my son and niece! Reduce, reuse, recycle! I would be shopping for my baby Charlotte who is due on October 28th. I’ll be shopping for my 18 month daughter. Can’t wait! I’d shop for my infant son and my 2 year old! I need to shop for my four week old daughter and my sister’s kiddies! I love this sale, been going to this for 7 years! I will be shopping for my son and daughter. Is shop for my two sons. My little guys are growing like weeds! I would shop for my almost one year old, and my 9 year old. I love these sales! Reduce, reuse, recycle! I would shop for my Daughter Gabriella who is six years old! I would be shopping for my 14 month old twin girls! Always wanted to go to one of these, looks amazing! Girls need things for winter and maybe early x-mas shopping. Diane A. I would be shopping for the many children and babies of friends. I’d shop for my 2 yr old triplets and my baby due in Feb! I would be shopping for our 2 year old son, 1 year old daughter and our boy/girl twins that are due in 8 weeks!!! This sale is so greatly appreciated by our family!